What’s the episode about? A rich guy named Max starts to believe that he is Zeus, because he has racketeering problems and a staff that shoots electricity. He thinks his high-rise building is Mt. Olympus. Batman rises out of the darkness to the roof of Max’s skyscraper on a batcraft, and Max thinks that Batman is Hades, which is fan-tastic. Max goes totally mad, and his ladylove tries to help him but fails, which is sad. By the end, he’s completely power-crazy and ends up in Arkham. Why are you sharing it? 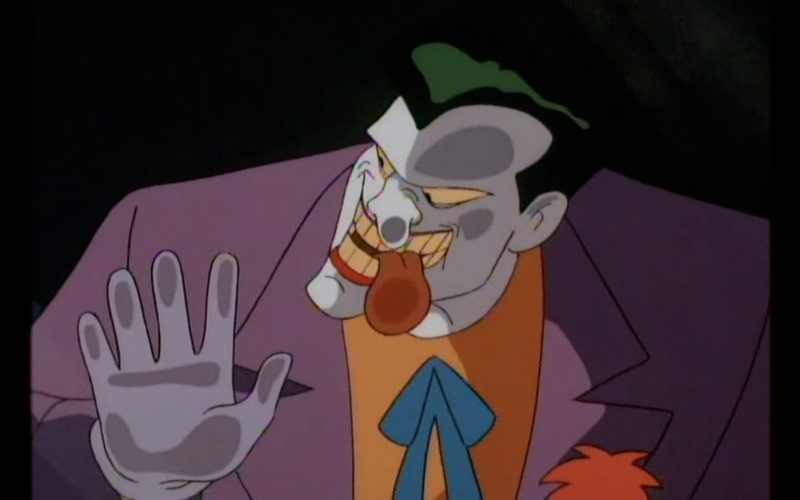 Joker appears in his cell as Max describes him, far away at first, but then suddenly right at the glass, pressing his face against it and sticking out his tongue. His sudden closeness is creepy, but when he sticks his tongue out, he looks like the hyenas from The Lion King, and it makes me laugh. I also wish that Max (or the writers) had compared more rogues with Olympic gods, let’s see what we can think of by ourselves. Mr. Freeze is another candidate for Hades. Poison Ivy could also be Aphrodite. Aquaman or Black Manta as Poseidon, though they never featured in Batman:TAS. Clayface was vain like Narcissus, which led to his disfigurement, but Max wouldn’t know that. Greeks and Gothamites don’t really match up. :/ I didn’t even know Hermes was the trickster, I just thought he was the messenger. Wait. TWO-FACE AS JANUS, YOU GUYS. Ok I feel better now. He’s Roman, but at least it’s a perfect fit. Ok. Good enough.